Way back in the day, when the world was black and white, and I was only 15, my mother, after a great deal of beggin on my part, finally allowed me to attend my first concert. This woman was tough. KISS in Augusta in 1975, “Mom PLEASE???!!! !” “No.” “But Mom, it’s UFO!” Again in 1975. “No.” “Cheap Trick?” “Again, NO!” Finally, I got a “Yes” …on the condition that she and my stepfather went along as well. It wasn’t that bad, my stepfather was a biker, and he brought me and Mom down to the front row where we hung on to the barricade and watched the show. My first show? ZZ Top in 1977. I remember the opening act, The Blend, played and I thought it was the coolest thing I had ever seen. I said to my folks. 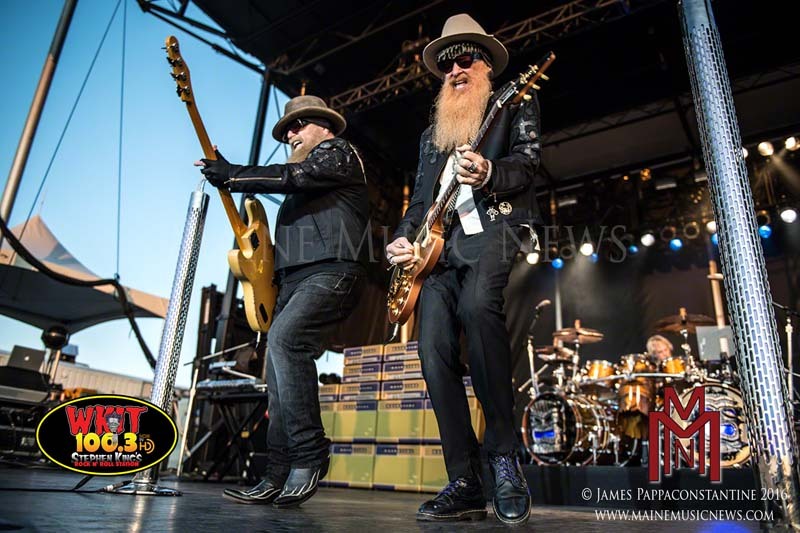 “That was great.” My stepfather smiled and said, “That ain’t nothing, wait ‘til you see ZZ Top.” I looked at him puzzled, “You mean that wasn’t them?” In my defense, I was 15! I hadn’t actually heard much of ZZ Top, it was just a concert and I was being allowed to go. Things would change for the better really soon. The Maine State Pier is a good place to see a show, it’s right there on Portland’s Waterfront, and I do mean right there ON the Waterfront. The only drawback, is that the stage sits facing the west, and since the sun sets in the west, those onstage either have to wear sunglasses or squint, and the stage lighting is washed out. All the photographer nit-picking aside, it was still a great show. 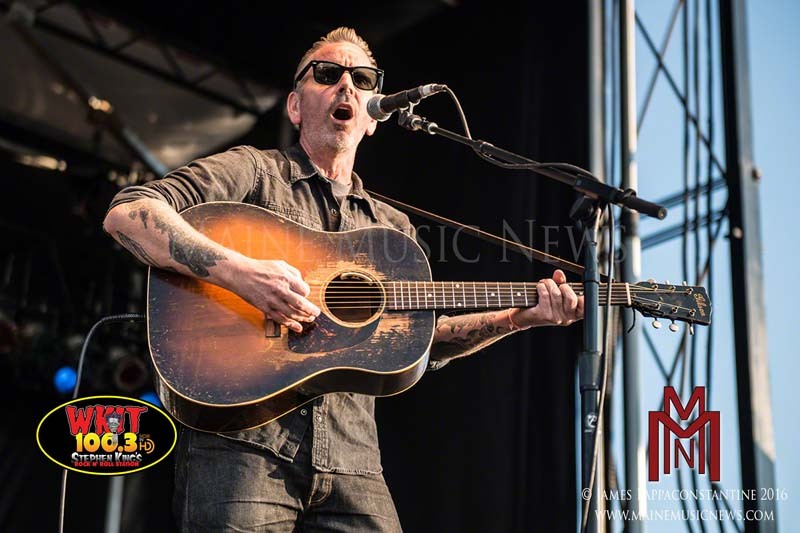 Opening the show was Social Distortion’s own Jonny Two Bags, who is out on the road promoting his first solo album, Salvation Town. Jonny played an abbreviated set, yet it was very well done. Armed with just an old Gibson acoustic, Jonny stood and hammered away at some great material, and the audience seemed to really like what he was dishing out. 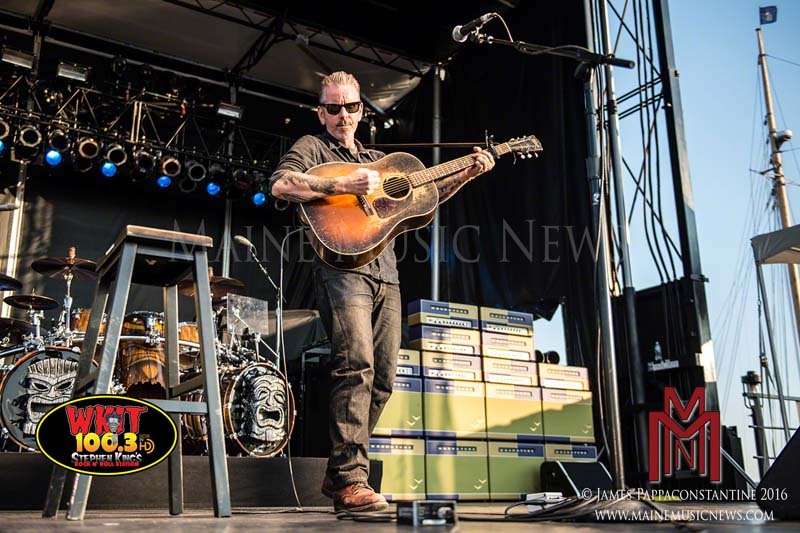 For one man armed with only an acoustic guitar that is not an easy task – I’ve seen plenty of warm up acts get eaten alive by fans waiting for the main event. But not tonight. Jonny’s stripped down sound went over very well. So much so, that when I went out to the t-shirt vender at intermission to buy a Jonny Two Bags t-shirt and album, there was a line of people doing the same thing. 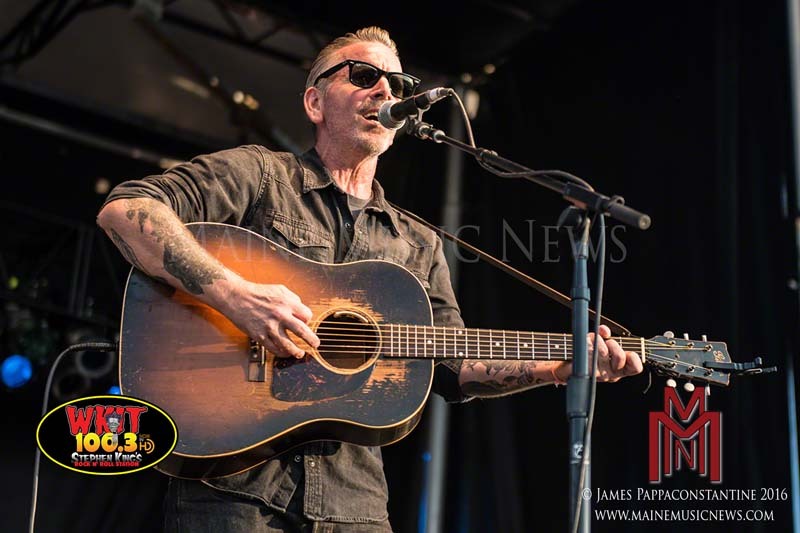 Look for his release, as well as the rest of Social Distortion, out on the road. ZZ Top wasn’t slated to start until 7:30, but for some reason, they went right on nearly as soon as Jonny’s mic was struck from the stage. This was fine by me as KISS was playing up the street and I was given tickets to that show, so after ZZ Top I was going to go up and catch the end of KISS, but as it was, I was going to be able to catch both shows. A big night of rock and roll in Portland! That “little ol’ band from Texas” opened the show with “Got Me Under Pressure” and seeing Dusty and Billy’s grins made me think that wow, after all these years these cats are still having fun. Drummer, Frank Beard, behind his kit was only a head, but I did catch him with his eyes open three or four times. Nearly every time I’ve seen the band lately, Frank always has his eyes closed. 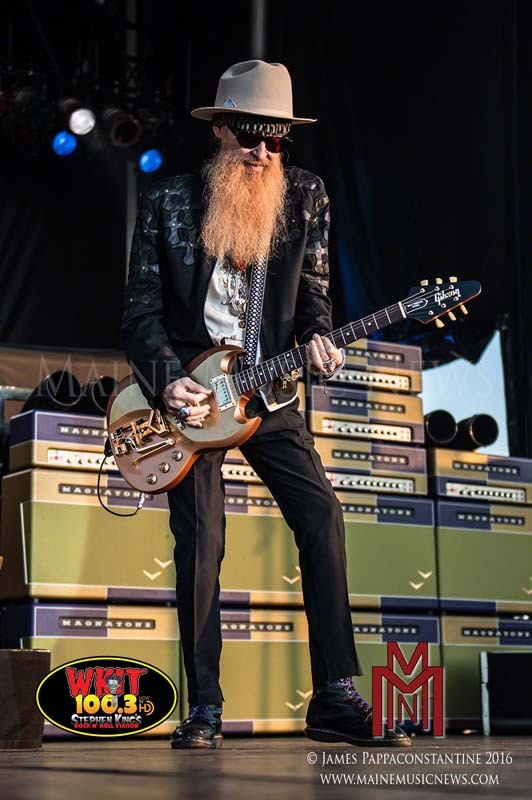 Billy Gibbons is an exceptional guitar player, a guitar God to many, and underrated at the same time. Kids today, and even back in the eighties, always seem to think the guy who plays fastest is the best, i.e., your Yngwie Malmsteens and your Steve Vais and whoever that guy from Dragon Force is. But the fact of the matter is that speed is not what goes into making a great guitar player. No. A great guitar player must know how to play tastefully and with emotion. Billy has great tone and delivers just what is needed. 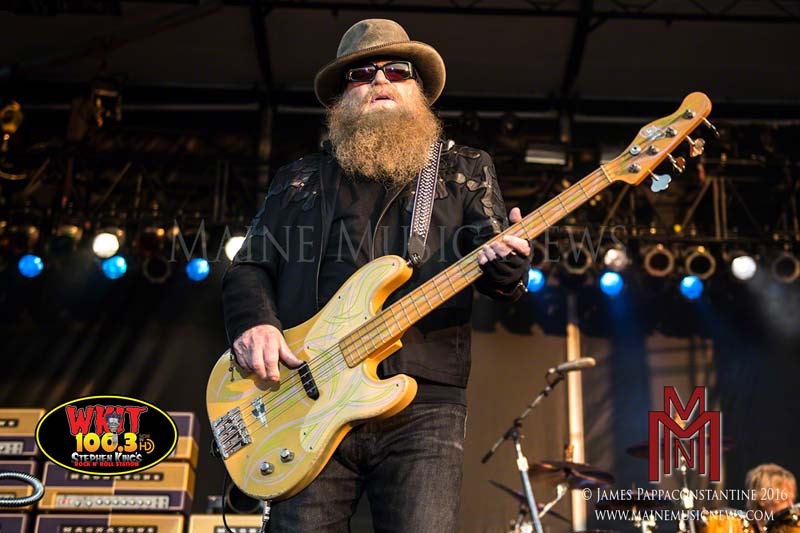 On bass, Dusty Hill holds down a great groove that locks right in with Frank’s drums, and together the pair lay the foundation for Billy to play over. The band played mostly hits, their own with a few covers as well including Jimi Hendrix’s “Foxy Lady,” as well as Merle Travis’ “Sixteen Tons.” The band came on for two finales, the last one was a cover of Elvis Presley’s “Jailhouse Rock,” which the band recorded on their 1975 Fandango LP. 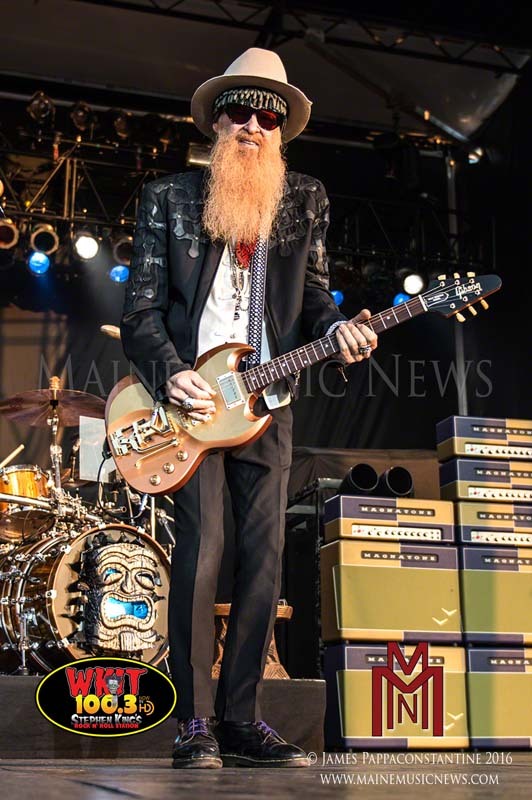 A notable addition to this year’s set was featuring Dusty Hill on keyboards for a couple numbers. You might recall ZZ Top’s Eliminator album had some keyboard songs. 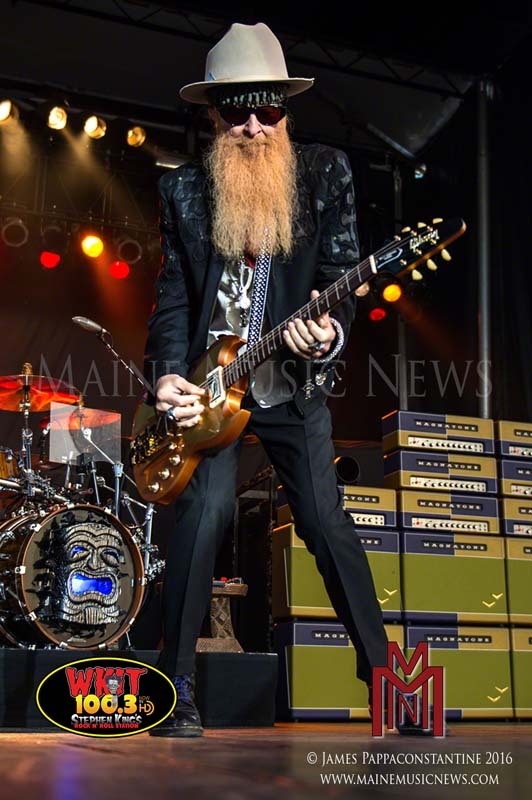 Bottom line – ZZTop put on another great show.